A tail prop gourd trap SOLUTION. 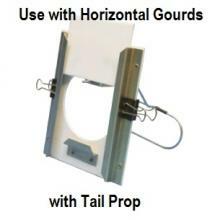 This trap is specifically made to use with Troyer Horizontal Gourds that have a ROUND hole and tail prop. It traps House Sparrows, European Starlings and is also great to trap purple martins for banding and or band reading purposes. Troyer gourd is NOT included. This trap can be installed and removed in seconds.